wood, inkjet prints, paint, electroluminescent wire, lcd screen, media player, speakers, transformer. 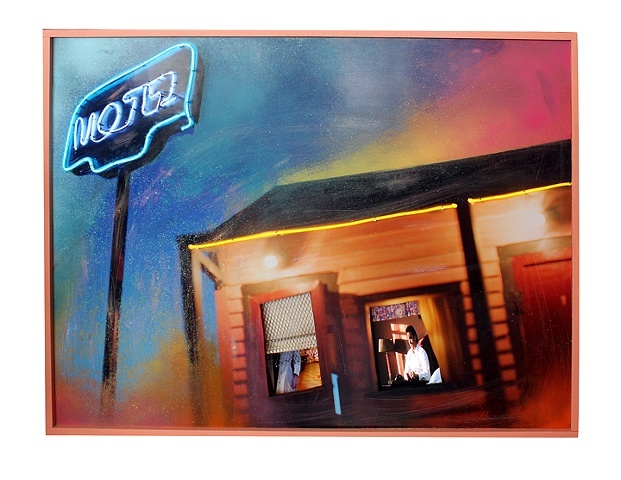 This piece is made using an image of my first motel sculpture, with spray paint. One room is 3-dimensional, with a cutout of me as the Woman on the Run, while the other window plays mysterious, sometimes sensual clips from The Grifters.The neon words flash while the outlines on the sign and the motel remain static.